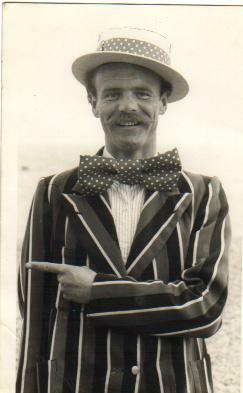 ‘Uncle’ Jack Howe worked for Brighton Corporation as a welfare officer but during the summer holidays had a stage at Peter Pan’s Playground where children were invited to entertain the audience. Children would sing, dance, recite poems etc and be rewarded with a lollipop. One of his ‘discoveries’ was Carol White of ‘Cathy Come Home’ fame. Uncle Jack came from Wakefield in Yorkshire and lived with his lovely wife Edna in the flats in Ditchling Road. When his daughter and son-in-law(my last school teacher), emigrated to New Zealand in 1970, they wanted Jack and Edna to go with them. He said he would go when he retired as he would miss ‘his’ children during the summer. He loved children and he and Edna were often seen at jumble sales buying good clothing, which was washed and repaired, if necessary, and given to the poorer children in Brighton. Edna went out to visit New Zealand, but Jack would never go, vowing that when he went it would be to stay. Unfortunately Jack never got there as he died suddenly in 1976 (he was my eldest son’s godfather). Edna did go to New Zealand where she lived with her daughter and son-in-law until her death in 2008. There was a commemorative seat put in Peter Pan’s Playground, but I do not know what happened to it. I questioned Brighton & Hove bus company as to why there wasn’t a bus commemorating ‘Uncle Jack’. Thanks to my question and with the information I gave them, there is now a bus dedicated to Jack Howe. Jack is mentioned on this site. This was my reply in 2008.. I remember Jack Howe very well. My mum and dad used to take my brothers Graham, Roy and me to watch the kids in the talent shows that Jack had been putting on for the Brighton kids for 25 years. I remember my brother Roy going on stage and becoming very shy and rubbing his eyes, Jack still gave him a lollypop. Jack died in 1977; only last year 2007, Brighton and Hove Bus Company dedicated a bus to him, his name is on the front. Thanks for corrcting me on the year of Jack’s death Maralyn. I miscalculated, but knew my son was 6 when Jack died. 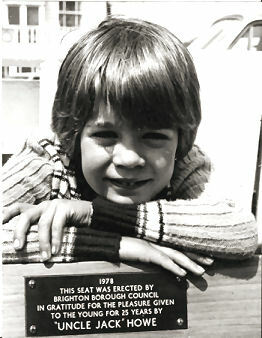 I wonder what happened to the seat that was dedicated to Jack in Peter Pan’s Playground. We were invited to the unveiling by the mayor at the time, Alfred Feld, and we have photos of my son Steve on Mrs Feld’s lap whilst she was seated on Jack’s seat. Thanks June for posting the article and photo of Uncle Jack; it brought back many happy memories of what seemed long hot summers of the 60s. As I lived in Kemp Town, Peter Pan’s Playground was a 10 minute walk for us kids. Playing on the swings, slides, roundabouts and listening to the kids on Uncle Jack’s stage was our summer, Life was so uncomplicated then for children. Peer pressure, what was that? Great times. Thank you so much, June! I was really pleased to see that I’m not the only person who remembers Jack Howe with fondness, and on the photo he looks just as I remember him. I was one of the children who regularly went up on his stage to sing a song, starting in 1953 at the age of 3 with a rendition of that big hit of the day,”How Much Is That Doggy In The Window?”! Being a Kemp Town kid (from Crescent Place) I spent a lot of time at Peter Pan’s playground and continued singing pop songs there for several more summers – probably not very well, but always word-perfect as far as I remember. Jack used to sing quite a few songs himself – old-fashioned ones like Al Jolson’s “Mammy” and one called “How You Gonna Keep ‘Em Down On Farm?” – with considerable gusto. As Michael Brittain said: that was a great time to be a child! I remember Uncle Jack well. My Mum and I used to go to see his show quite often as we lived on the seafront in Hove (Adelaide Crescent). I went on a stag eonce and sang tiddly winky winky woo tiddly winky woo, I love you (anybody remember it?). Uncle Jack was very kind and I had a nice lollypop, was there somebody playing the piano on stage? or am I dreaming it? I also remember Uncle Jack. I remember singing Goosy Goosy Gander on the stage. I believe it was his wife who used to play the piano. I wonder if the lady from Kemp Town would know my cousins who used to live in Hereford Street. They were Linda and Jean Simpson. Jean still lives in Kemp Town. His wife, Edna, didn’t play the piano, she always sat with the audience. It was another lady played the piano but I don’t know who she was. I also remember Jack, I spent many happy days at Peter Pan playground with my brother, Billy Borrill. Our Mum worked at the playground during one summer. We both still live in Brighton and we attended Queens Park Secondary Modern School in Park Street. Would love to hear from anyone who remembers us. Sandie, I have this week attended Grandparents Day at my youngest grand-daughter’s school here in Oz, at the end of which the beautiful little choir of 4-6 year olds gave us their kiss-blowing rendition of your song “Tiddly widdly winky woo, I love you”. I wondered where I had heard it before!! Well I’m of the Bennett family, Jack was my Grandad’s brother-in-law. Uncle to my father Bruce. I’m quite emotional to see a picture for the fist time of Jack and to learn all the lovely things said about him. I’m visiting Brighton next week and thought I would do some home work on the family connections. And I have to say completey proud to be a Bennett, and of Uncle Jack! Oh we all love to linger round the lido at jolly old Peter Pan’s beside the sea. Oh we all love to linger round the lido, the lido is the place for you and me. The lasses and the lads, the mothers and the dads are all just as happy as can be because we all love to linger round the lido At jolly old Peter Pan’s beside the sea. Wasn’t that the song Uncle Jack began every session with? Or something close to that? I grew up in Brooklyn, NY from the 1940s on. When we were teenagers, one of our group party songs was “Tiddly Winky”.” I just looked it up and was so surprised to see that the song came from England. I never heard of Uncle Jack Howe before and was delighted to read about him. “Tiddy Winky” became our parting “mantra” at party’s end before we drifted home. We have our grandchildren singing it now. I really don’t know the whole song and lyrics and would love to find out about its inception. How did it get to Brooklyn in the 40s. Was it brought back from WWII? I remember Jack, I spent most of the summer in the playground, and took to the stage nearly every day! (1954-1957). Geoff was his first pianist followed by Mrs White, who was the wife of the owner. I used to sing with Carol White, who went on to star in films, while Hayley Mills and her family were also visitors. Pamala Wilcox-Brown made a film of Brighton, called the Brighton Story which featured the playground stage. Jack was a great all- round entertainer and a wonderful person. I have a signed picture of Jack, as featured at the top of the page. I used to live in Princes Crescent and Uncle Jack used to live in Sylvan Hall estate. I used to go to his flat and remember Madeline, a very pretty girl with blonde curly hair. I do think every mum in those days took their kids to see him at Peter Pan’s. Great fun . I remember Uncle Jack and his wife Edna with fondness as we used to go to Peter Pan’s everyday in the summer from 1972 to the year before he died. I will always remember his Lido song with him banging his elbow on the back wall. He was someone that made a great impression on me. I often take my kids to Briighton and took them to the playground and tell them the story which is sadly marked by an empty space and wish they could have experienced something so special. Oh the good old days! I was talking about Uncle Jack last night with my brother Laurence and, wow, seeing that picture of Uncle Jack brought it all back. He looks a lot younger than I remember. But it was great that stage. I never had the guts to go up. But looking back now surely Jack was the first X Factor. Peter Pan’s was great in those days. Why why has our council let it all go to pot?! I feel so sorry for kids today. They never had Uncle Jack. I remember you Mick Penfold – best boy singer at Peter Pan’s Playgound with Uncle Jack singing “He’s got the whole world in his hands”. You were also one of the choir boys along with Victor Falkner and we all went around together and to St Marks Hall. We had a girls’ and boys’ club there every Friday night and my dad Mr Cushing used to get the old record player going for us all to dance to. Those were the days. Uncle Jack was a great and kind man; will never forget him. Does “Uncle Jack’s Back” ring a bell with anyone? Was his show called that maybe? I used to love my mother taking me to sit and watch Uncle Jack and all the children singing on the stage. I remember a boy singing Cliff Richard’s Bachelor Boy was my favourite. I also remember ‘Uncle Jack’ he was one of Brighton’s great characters. Was he also involved with Queens Park School and school boy boxing? tiddley winkey winkey woo tiddley winky woo, I love you, tiddley winkey winkey woo tiddley winkey woo, love Mr too, I love you in the morning and I love you in the night, I love you in the evening when the stars are shining bright, tiddley winkey winkey woo tiddley winkey woo, I love you. That earned me a lolly pop from Uncle Jack. Funnily enough my given name at birth was Edna, the same as his wife’s. Uncle Jack the school board man. What a character. They don’t make them like him any more. A great man! I remember Uncle Jack. I remember him with his show down at Peter Pan’s playground during the summer. But I remember Jack from my time as a member of 2nd Preston Guide Company based at St. Saviour’s Church, Ditchling Road; Jack was a member of the congregation with his wife. Jack became a member of the Committee that fund- raised for the 2nd Preston Guides and the 56th Brighton Scout Group (also attached to St. Saviours Church). Every year the Guides and Scouts would put on a show for the local area and Jack would become the “warm up man” and the presenter for the shows. He was a wonderful man and loved being around and helping the kids of Brighton. Great memories of this time! Isn’t it brilliant to have this photo of Uncle Jack. I used to sit in the audience for hours during those long hot summers in Brighton trying to be brave enough to put up my hand and sing. I remember the first time I did Uncle Jack must have been waiting and called me up straight away, I was horrified. I went to St Marks school, lived in Walpole Road and had a happy wonderfully blessed childhood pushing my dolls pram along the seafront in all winds and weather or strapping on my roller skates and zooming at what felt like breakneck speeds! Does anyone remember the wax works and the weird pots full of Ali babas thieves? Helen, do you mean the Ali Baba’s in the front window of the wax works, where they popped their heads up and down from big pots? The things I remember over the years at Peter Pans’ are the donkey rides, crazy golf, ghost train and roller rink. I also went to St Marks from 59 – 62. Yes David those thieves were really scary! Do you also remember the penny automated slot machines on the Palace Pier. The haunted house was my favourite, the fascination and imagination of a rather timid child who would spend all her pocket money and many fruitless hours hours watching them work. It’s hard to see that child now! Do you remember Miss Mawwhinney she was one scary teacher! Lovely memories of Uncle Jack at Peter Pan’s, singing along with children and banging his fist on the wooden partition. He was also a school truant officer, I believe. Spent so many happy summers at Peter Pan’s, remember him singing the Lido song. One of the buildings on Marine Parade now has Peter Pan’s statue up on a balcony. I recollect the high children’s slide in the playground, Wall’s ice cream, pleasure boat rides, coach mystery tours, the sea front dodgem cars, Black Rock swimming pool, the waxworks, the man outside the pier’s distorted mirrors shouting, ‘come and have a laugh, come and have a laugh’, Punch and Judy shows and so much more. A lovely innocent childhood. What wonderful memories! I have just spent the week-end in Brighton re-visiting all the old haunts. My sister was Carol White, and me and my brother used to sing along with her at the playground in the summer holidays. What wonderful, carefree summer days they were. Thank you Uncle Jack! Uncle Jack was my eldest son’s godfather, and as his family has emigrated to New Zealand after his death, we were invited to the unveiling of a seat in Pater Pan’s playground. It had a plaque on it in memory of him, I have photos (somewhere) of our son sitting on Mayoress Feld’s lap. I often wonder what happened to the seat. Well, so many happy memories. I was the girl who sang Burlington Bertie. The local paper did a feature on Jack and printed some of the performers’ photographs. Amelia, I am Susie and I would so love to hear from you. I wonder where the seat went? My son, Steve, was Uncle Jack’s godson. Hi all, and how lovely to hear from you, Susie. Hope to meet up soon! I am also remembering Gordon, the pianist with the striped jacket and bowler hat and Clive, the accordianist who had a cousin called Noreen I believe. Caroline also played the piano and I was going to be the pianist for the show as Uncle Jack asked me to do the summer of 1978, but unfortunately he died in 1977. I was very young then. Also in loving memory of Jane Moore, (Red Red Robin and Rock a Bye Baby) who sung like Lena Zavaroni and who sadly passed away recently. Recently the statue of Peter Pan has disappeared from the balcony of a flat in Marine Parade, anyone know where it has gone? It brought back so many happy memories to me when I saw it as I passed by on the bus. Hello! My name is Ewen and I am currently writing a musical about the life of Carol White. I was writing a scene set at Uncle Jack’s Theatre and came across this wonderful site when doing research. Thank you so much to everyone who has contributed memories here – they are invaluable! If anyone reading this has any other memories they’d like to share or – even better – if they knew Carol, then I would really love to hear from you. I can be contacted at ewen@oiseau.freeserve.co.uk – thank you! I worked at the Peter Pan’s playground as a kid in the early 60s and often took a break when I could to go along to Jack’s Stage and watch my sister Iva. She was quite popular with her rendition of “Sad Movie’ (always make me cry). When she would get to the chorus Jack would belt the side of the stage with many of the audience joining in. On hot sunny days there would be standing room only. Jack was an incredible entertainer and for children it was a time of fun and innocence. I spent many days of my summer holidays down at Peter Pan’s playground with my friend Alison. Our highlight of the day was going on ‘Uncle Jack’s’ stage singing ‘Billy Don’t be a Hero’. Also remember Jack singing the Lido song – many happy memories. Something randomly made me think of Jack Howe today and I was so happy to find this site of lovely memories. It was particularly sweet to see a posting from Mike Penfold! I remember him singing, or should I say ‘crooning’, songs of the day, back then. He was great, a real entertainer. As a child I spent many happy summers with my mother, watching Uncle Jack. I went on stage a couple of times, but I was pretty shy then. Uncle Jack used to good naturedly mimic the kids who weren’t brilliant entertainers like Mike Penfold, and I guess I fell into that category. By the way, I went to St Mark’s school and I believe Mike Penfold did too. Ah, happy, innocent days! i spent every day of my holiday with my mum at Peter Pans playground by Uncle Jack’s stage always eager to go on for a lollipop from about three years of age. My mum would sit on the deckchairs knitting while I was at the front watching and waiting. There were two sessions 10-12 and 2-4 and she would take a picnic and we would stay there all day. I remember there were paintings on the walls of the stage and I was too small to reach the mike so Uncle Jack would crouch down with me. Many years later in the 70s I met Uncle Jack in London Road and not only did he recognise me but remembered me by name. I had started teaching and only then did he mention he had been an EWO and how he really liked being Uncle Jack as it helped him when he saw the children in term time. A lovely lovely man. I loved Uncle Jack, what a great entertainer he was. I used to meet a lad down at Uncle Jack’s called Stuart Murray who always got up on stage, and sang ‘Green Green Grass of Home’. Stuart had amazing voice. Such wonderful happy memories. Does anybody remember Stuart Murray from Whitehawk area? I used to sing. All my life I wanted to be a barrow boy. Good memories. Hello, thank you for a fascinating page. For anyone who would like to see footage of Uncle Jack and the Lido Theatre, there is a lovely film called Brighton Story (1955) available on YouTube, in which we see a boy sing “If You Were the Only Girl in the World”.